The elegance of yesteryear is tastefully combined with modern spaciousness and luxury in this two story Colonial which features Western Reserve styling. The Shenandoah offers a master suite and your choice of 3 or 4 additional bedrooms. Downstairs you’ll find a powder room, with large living and dining rooms and a paneled family room. Fireplaces are optional in family and living rooms. And, there’s wall-to-wall carpet to enhance the luxurious atmosphere of this home. The kitchen includes a breakfast room, a pantry and handsome custom cabinets. In addition, there’s a laundry or mud room, a full basement–and options for a one- or two-car attached garage. Ryan’s Standard Energy Package super-seals and insulates your home against the elements. * And we conduct presettlement and six-month service inspections to assure complete satisfaction. Neat-o! I’d love to find a brochure like this for my place. I’m struck by how traditional the layout is. It’s very clearly a center hall colonial– similar to houses in my neighborhood from another colonial revival 50 years earlier. It’s good to be sealed against the elements – a roof, walls and windows work wonders! That’s awesome!! I hope I can find something like that on the 101 year old house I’m buying. I love old documents! interesting to fine the old floor plans to your house. Interesting that you could have had a 5 bedroom instead of a 4. Love the updates you and Kim have made since you’ve been there. I’m resurrecting this blast from the past back from the past (or something). I live in a very similar Ryan Home, the Westmoreland, which was built in 2008. 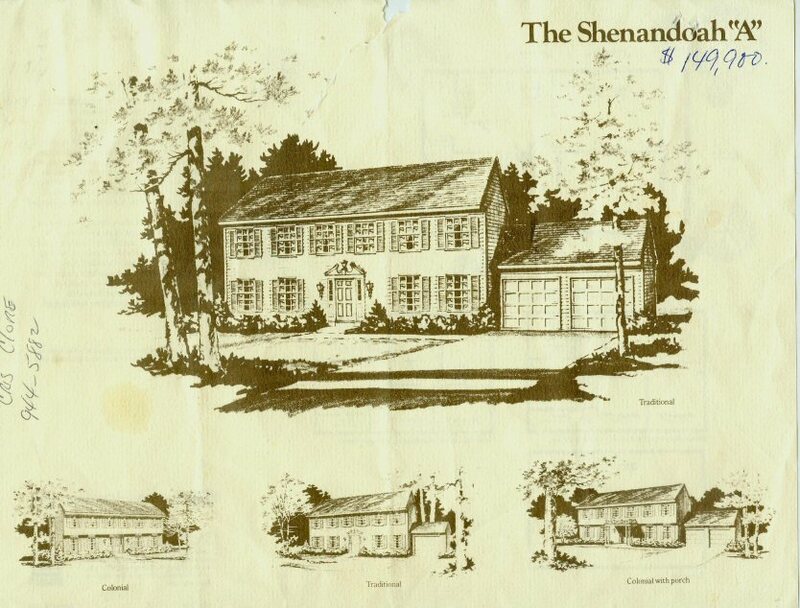 The Westmoreland is basically the same house with an integral garage instead of an attached garage. It’s interesting to see how little the floor plan has changed through the years – the master bedroom closet and bathroom are a little different, but that is about it. Haus, we have a few of those in our neighborhood. Would love to have you send us a picture of yours, and we can update this post with the other model. I am looking for blueprints/sales book etc.. for my 5 bedroom ryan home built in 1972 could have been forrunner for the Shenandoah. Built in PA Westmoreland county, but have seen in Allegheny count also. William – likely to be tough to find. 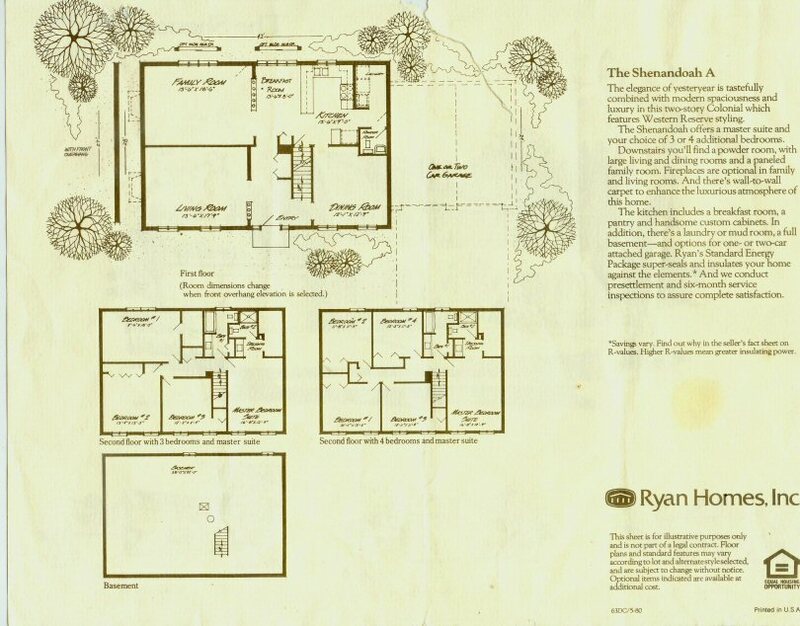 I called Ryan a while back and they said they no longer had the plans from homes they built that long ago. Ran into same road block, I am trying to find owners who kept sales info.